There are plenty of project management and time tracking software available in the market. So what makes AccountSight different from other time management software? Firstly, AccountSight is a cloud based time and expense tracking software. Therefore users can access AccountSight anytime anywhere without requiring any hardware or software. Only a computer with internet connectivity and you can submit your billable hours and project expenses and generate online invoices using AccountSight. Many of the currently available employee time tracking software does not allow to submit project expenses and can be used only for employee time tracking. Some software allows expense tracking, but not separately. You have to submit time and expenses together for a particular time period. Whereas, in AccountSight time and expense tracker, users have the flexibility to submit employee timesheets and project expenses as separate entities. The submissions and approvals of weekly time sheets and expenses are maintained independently. 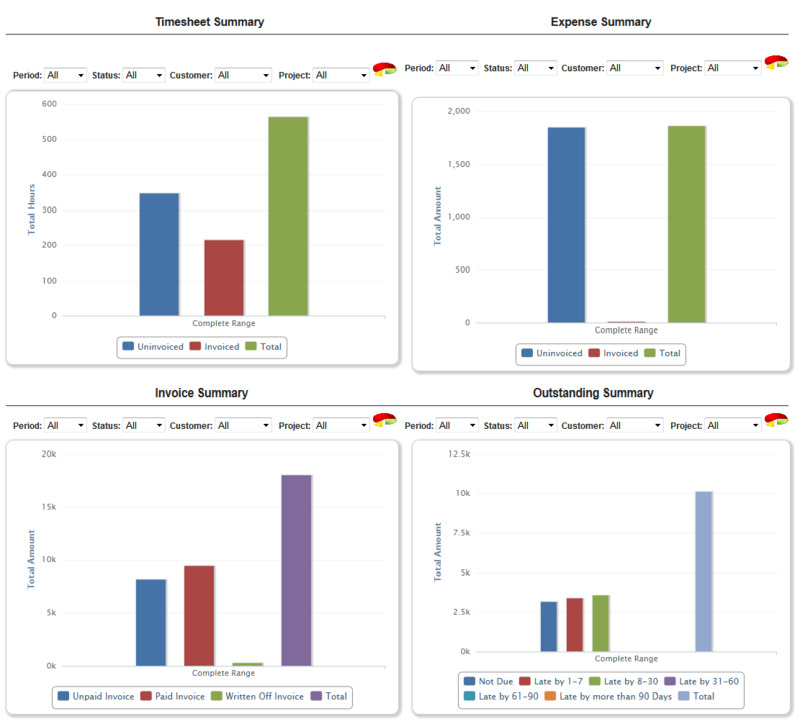 AccountSight’s rich and smart dashboard gives it an edge over other time and expense software. Users can view, filter and analyze time, expenses, invoices and outstanding invoicing summary using pie charts and bar charts. AccountSight allows users to save useful links and to upload necessary files, e.g. government regulations, tax policies, business ethics etc., for future reference for the employees and contractors. AccountSight provides notifications and workflow information of all performed and pending tasks on the Home page of the application. Users have the option to add header attachment with submitted online timesheets and expenses so that administrator and managers can view and verify the detail. 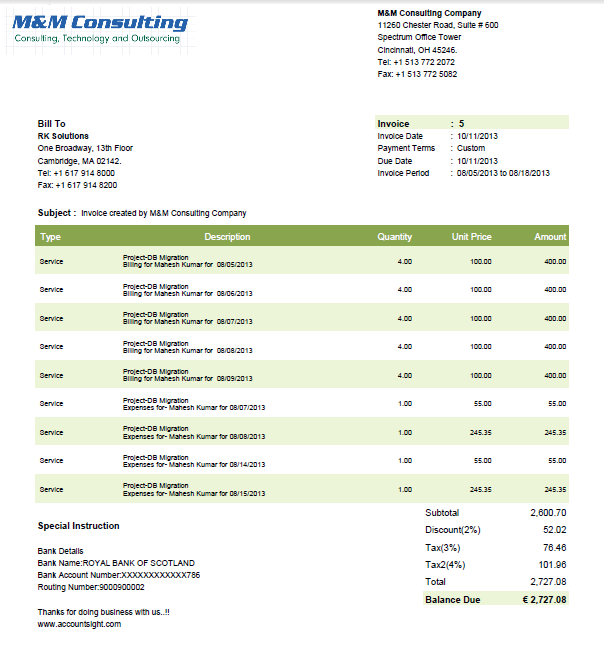 Users can easily download saved timesheets and expenses in PDF files for other purposes. Using the Excel Upload option, a user can upload and submit multiple employee timesheets and expenses within a few seconds without any hassle. Project managers and administrators also have the provision to approve single, multiple or all the pending timesheets or expenses together. To add more flexibility and convenience, AccountSight allows users to simply copy an old timesheet or expense sheet of earlier week and submit it with necessary modifications. Since some companies focus on having professional and stylish invoices for their clients, keeping that in mind AccountSight invoice tracking software offers professional yet simple looking online invoices in three different colors: black & white, blue and green. In addition to all these, easy navigation between pages and an attractive price makes AccountSight a unique online time and billing software. Also, it offers a FREE trial of 30 days before you decide to purchase for full use. Does your time tracking software have these features? Do you want to try AccountSight project tracker to experience the benefits? Register here now!